Welcome to the new AWS Publications Ltd website. Select from a range of mainly mathematics resources written in New Zealand for teachers to use in the classroom or as a homework resource, plus a range of Student Workbooks for parents / care-givers, home-schoolers & tutors can use at home. Mathematics is a universal subject, therefore these resources are also suitable for use in countries other than New Zealand. If purchasing from outside of New Zealand, please select PDF versions only. If you are interested in book versions being sent outside of New Zealand, please contact the author (Contact) to discuss your needs and arrange for additional postage & packaging costs. Looking for mathematics resources to use at home …. Parents, care-givers, home-schoolers or tutors looking for resources, please select from the RESOURCES FOR HOME section of the shop. select from a range of NINE Numeracy Flash Cards sets. Help your child at home and save on expensive tuition fees!!! Contact the author directly (Contact) if you need help selecting (03 338 0516). Looking for mathematics resources to use at school …. Teachers looking for resources, please select from the RESOURCES FOR SCHOOL section of the shop. charge purchases to your New Zealand school’s default SCHOOL ACCOUNT. Conditions apply for school accounts, see FAQs & Policies pages. Contact the author if you have any inquires (Contact) or 03 338 0516.
get instant PDF download links at the time of purchase (credit card method only). Register on the AWS Publications Ltd website to take advantage of these discount offers!! Fill in your details on the My Account page. The more you purchase, the more you SAVE!! 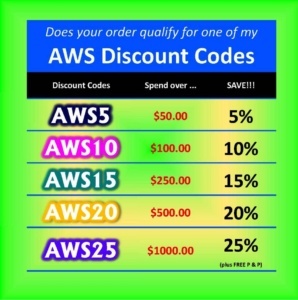 Select one of the DISCOUNT Coupon Codes and SAVE $$$ … Apply the appropriate AWS Coupon code at the checkout, once you have completed your selection.